State law requires the Education Commissioner to intervene if even one school chronically fails state standards. 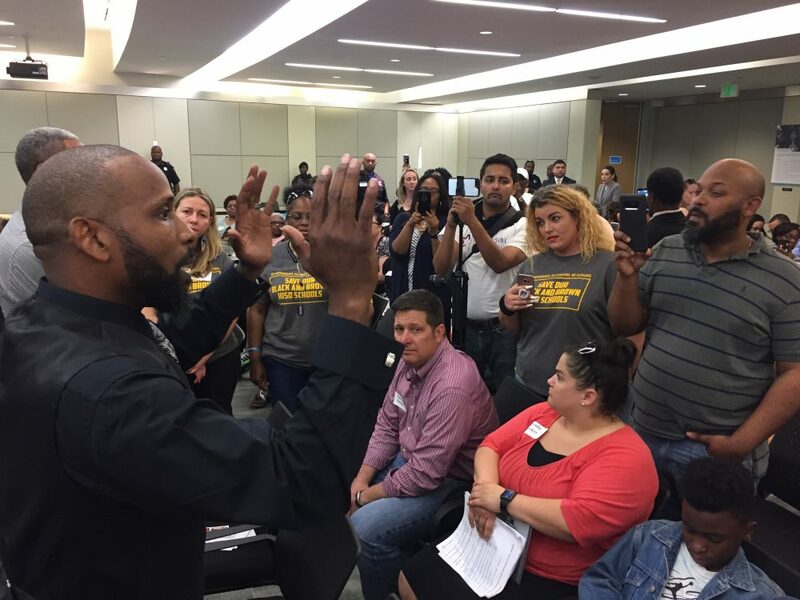 Parent and activist Travis McGee addressed a crowd of people at an HISD meeting in April 2018 while the board was in closed session and before a scuffle erupted with police officers. The Houston Independent School District has been in turmoil since the threat of a state takeover emerged in 2017. With over 200,000 students, it’s the largest school district in Texas and the seventh largest in the country. The uncertainty in HISD has grown because of Hurricane Harvey, the abrupt departure of its superintendent Richard Carranza in 2018, and school board leadership that some describe as dysfunctional. But what exactly does a state takeover mean? And how likely is it to happen to HISD? Here’s what you need to know. Why does HISD face the threat of a state takeover? In 2015, state lawmakers passed a measure, HB 1842. It says that if a public school fails state standards for five or more years, then the Education Commissioner must either close that school or replace the district’s entire school board with outside managers. HISD currently has four schools that could trigger these sanctions if they don’t improve. What would that takeover look like? The board of outside managers is supposed to include community leaders, business representatives and education experts. If appointed, they must receive some leadership training. The commissioner can replace them with new managers if the low-performing schools continue to struggle for two more years in a row. How can HISD avoid this? The four schools that could trigger the sanctions are: Highland Heights Elementary School, Henry Middle School and Kashmere and Wheatley high schools. If they all pass state standards when results are released in August, the threat lifts. Another option: HISD can get a two-year break on the sanctions under another law, SB 1882 passed in 2017. Under SB 1882, districts can temporarily handover the low-performing schools to an outside group, including a nonprofit or charter school. That group then manages their finances and administration and can receive more money per student. What’s the board’s role in all this? The nine members of the HISD school board decide if they will close schools or partner with an outside group to avoid a takeover. The current board has been highly criticized by parents, community members and even Governor Greg Abbott for their behavior. 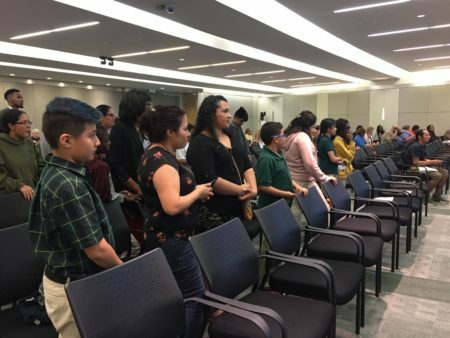 There have been raucous meetings that included people being arrested, an abrupt firing of the interim superintendent, and complaints of a divide between black and Hispanic trustees. The board can also give policy direction to the superintendent to improve struggling schools. For example, trustees launched the Achieve 180 program in 2017 to strengthen low-performing and under-served schools with more support and wrap-around services. Can the board sue the Texas Education Agency? Some parents and education advocates want HISD to sue the TEA to prevent a takeover. 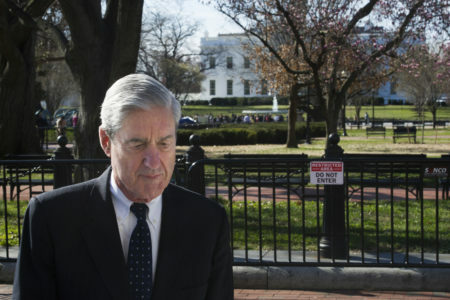 Due process claims or voting rights issues could come into play. But some see a lawsuit as problematic with little chance for success. No lawsuit against HB 1842 has been filed yet, though teacher unions have sued the TEA over the charter partnership law. What’s the mayor’s role in all of this? Houston Mayor Sylvester Turner wants to create a public-private partnership, similar to a model used in Los Angeles. His educator director created a nonprofit, the Coalition for Educational Excellence and Equity in Houston, to help turnaround up to 15 public schools. But the HISD board decided against seeking proposals from any outside groups in December. 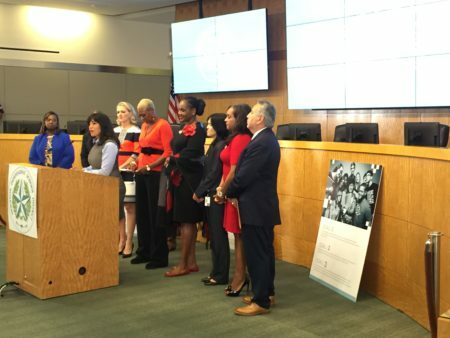 The HISD board wants lawmakers to revise the trigger law, according to their 2019 legislative agenda. However, some representatives, notably state Sen. Paul Bettencourt, R-Houston, have indicated they want to alter HISD’s governance. And in January, Gov. Greg Abbott tweeted scathing criticism of the board, calling it a “joke” and a “disaster” and seeming to favor a takeover. Not exactly. No district has seen its elected board replaced under HB 1842. The TEA, however, has taken control of other districts for other reasons, such as El Paso for a cheating scandal on high-stakes tests and Beaumont for fraud and mismanagement. What have other districts in this situation done? 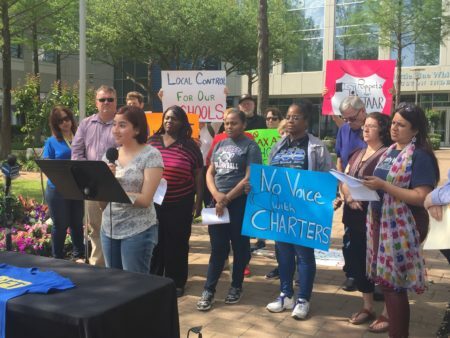 Other large, urban districts with chronically struggling schools, such as Dallas ISD and San Antonio, have chosen to close those campuses or partner with charter operators. HISD has until February 4 to send the state any proposals if it wants to partner with an outside group and get a two-year break on sanctions. Other than that, watch to see if lawmakers revise any of the rules during the legislative session, and how the four HISD schools perform on state ratings in the summer.